Search our extensive inventory to find your antique or vintage lighting fixtures by style (Arts & Crafts, Spanish Revival, Bungalow, etc.) or by year using the links below. This mid sized milk glass schoolhouse globe has a unique profile which we do not see very often. A good looking straight forward vintage ceiling fixture shown a new nickel fitter. 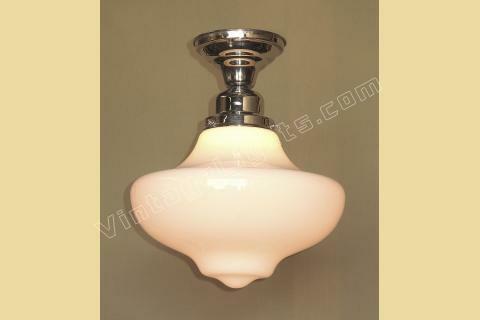 VintageLights.com offers restored antique & vintage lighting fixtures. Specializing only in antique & vintage light fixtures, no reproductions. Search VintageLights.com's extensive inventory of antique and vintage lighting fixtures. Browse all of our antique lights and vintage light fixture styles (Arts & Crafts, Spanish Revival, Bungalow, Bathroom, Kitchen, Sconces, etc.). Please check out our wide variety of lighting fixtures and our other great selection of light fixture products including individual slip shades.